My name is Natasha and I am a shrimp-aholic. You must give this garlic and herb shrimp recipe a try. 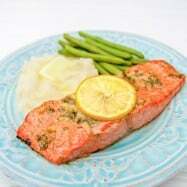 The ingredients are simple, the prep is easy and you saute for less than 5 minutes. Between the garlic, lemon and Dijon, it packs a lot of flavor. 1/8 tsp freshly ground black pepper. 1. Clean the shrimp, remove the shells. Make a slit down the back of the shrimp and clean well. This will also create the “butterfly” effect. Pat shrimp dry with paper towels. 2. Mix together all of the ingredients except the shrimp. 3. Add shrimp and coat well with the mixture. 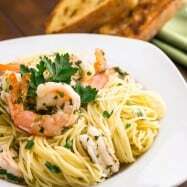 Allow the shrimp to marinate for 10 to 15 minutes at room temperature. 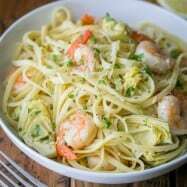 Don’t marinate them longer or the lemon juice will start to cook the shrimp. 4. In a large saute pan, heat 2 Tbsp olive oil on medium-high heat. Add the shrimp and cook about 1 1/2 minutes on each side, or until cooked through. 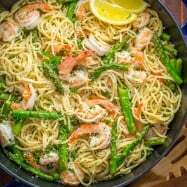 It’s easy to over-cook shrimp and make them rubbery and keep in mind, as long as the skillet is hot, it will keep cooking even if you turn off the stove. Clean the shrimp, remove the shells. Make a slit down the back of the shrimp and clean well. This will also create the "butterfly" effect. Pat shrimp dry with paper towels. Mix together all of the ingredients except the shrimp. Add shrimp and coat well with the mixture. Allow the shrimp to marinate for 10 to 15 minutes at room temperature. 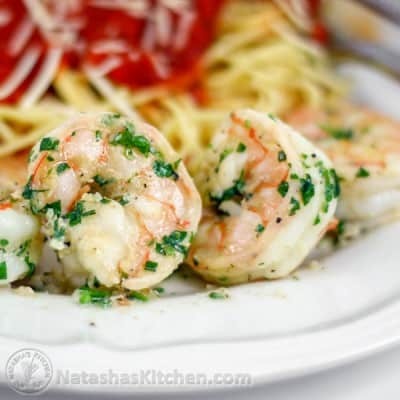 Don't marinate them longer or the lemon juice will start to cook the shrimp. In a large saute pan, heat 2 tablespoons olive oil on medium-high heat. Add the shrimp and cook about 1 1/2 minutes on each side, or until cooked through. 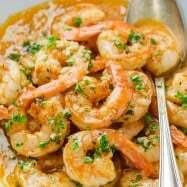 It's easy to over-cook shrimp and make them rubbery and keep in mind, as long as the skillet is hot, it will keep cooking even if you turn off the stove. Thank you, Natasha, for the recipe! Prepared it for dinner yesterday. The shrimps were full of flavor, not rubbery and we have none left ))). Very easy to make and the bonus is the sause which my kids almost drink ))). 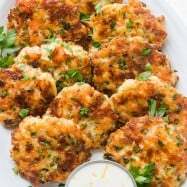 Those shirmp look lovely…and such an easy recipe!